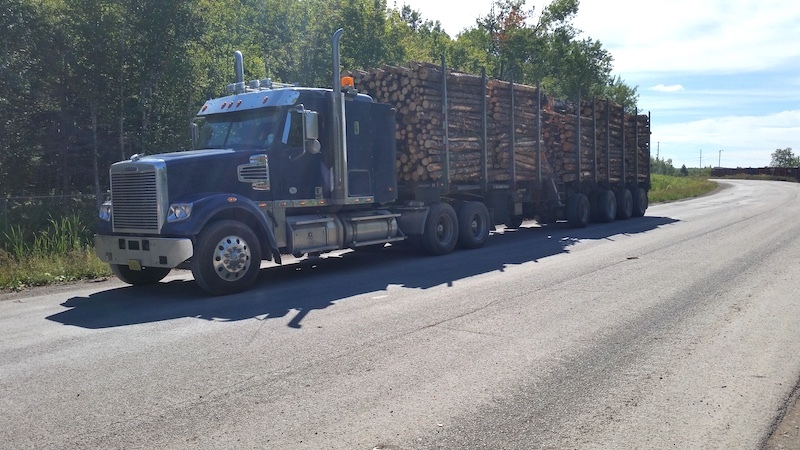 Thanks to recent road reclassifications in Nova Scotia, log haulers can now travel with heavier payloads on 10 per cent more of the province’s roads. The reclassifications specifically allow for the wider use of B-trains (two trailers linked together by a fifth wheel), a move that is expected to eventually result in $7 million in annual costs savings for the transportation and forest industries. This move did not come as a surprise for Bruce Chisholm, chair of the Forest Nova Scotia (FNS) Transportation Committee, which has been working together with the Nova Scotia Department of Transportation and Infrastructure Renewal (TIR) for four years to “get Nova Scotia’s road network to be competitive with other jurisdictions in Canada,” he said. “The mandate of the committee’s work is that any changes we make must be safe, productive and infrastructure friendly.” A further bonus of the larger trucks is reduced greenhouse gas emissions. Before the reclassifications, around 50 per cent of the 23,000 km were limited to a max weight of 41.5 metric tonnes, 15 per cent at an intermediate weight of 49.5 tonnes and only 35 per cent at 62.5 tonnes. According to Chisholm, the other province with a similar challenge of roads with a low allowable weight is New Brunswick, at 43.5 metric tonnes. In contrast, Quebec and Ontario have higher allowable weights for seven-axle trucks, and Alberta, Saskatchewan and B.C. have even higher allowable payloads because they have a newer road system and allow even bigger trucks under special conditions. Over the years, large forest haul trucks have evolved, with seven- and eight-axle trucks replacing the more traditional six-axle truck. The legal GCW of a six-axle truck at 49.5 tonnes results in a payload of about 30 tonnes, Chisholm said. Seven-axle trucks, at 55.5 tonnes maximum, and eight-axle B-trains, at 62.5 tonnes maximum, are the preferred vehicles for log hauling because they are more efficient and competitive. “Think about it this way: if you’re only allowed 41.5 tonnes, and your truck weighs 21.5, you only get a 20-tonne payload. Whereas that B-train, at 62.5 tonnes, has a 40-tonne payload. So, it’s a huge difference in the cost to move that wood,” Chisholm explained. Consequently, the committee and the Department of Transportation have been working to identify all roads that can be reclassified from 41.5 and 49.5 metric tonnes to 62.5 metric tonnes. Working with researchers at FPInnovations, TIR determined that the seven- and eight-axle trucks have less impact on pavement than moving the same volume of wood with six-axle semis. Consequently, TIR’s criteria is no longer limited by pavement. The TIR FNS team first conducted a GIS (geographic information system) exercise, identifying the roads without any bridges that connected to the present 62.5 tonne network. These were the “low hanging fruit,” which resulted in almost 2,400 kilometres more permanent B-Train routes in 2017. To date, the province has added more than 10 per cent to Nova Scotia’s network of B-train routes. However, 40 per cent of Nova Scotia’s road network still has a maximum allowable weight of 41.5 metric tonnes. The committee and the province are working together to reclassify those as well, Chisholm said. “Now it’s dependent on bridges. The first round was all the roads that don’t have any bridges at all. Then, what we’re calling round two of this process, is any road that connects to existing maximum weight roads that have bridges built in 1988 or later. They are designed for the B-train loading. That process is just starting now,” he elaborated. Round three will be identifying all other bridges capable of handling the change to B-Trains – many of these being less than 15 meters long. By identifying all the bridges that are acceptable for B-train loading, Chisholm believes the province will be able to upclass another 20 to 25 per cent of the road network. This provides a significant “opportunity for improving profitability for the trucker and for controlling the cost for the industry, while protecting the province’s roads.” Chisholm said. Overall, working with the province has been a positive process, said Chisholm. “For industry, it tends to be a bit frustrating sometimes because government doesn’t move as quickly as industry would like. That’s the reality, as they have lots of things to consider, too. They have a very structured process that has to be followed, and the success of it has been because of a real willingness on the part of the Department of Transportation to work with the industry,” he shared.